Clandestine "Masonic" orgs in IL. I had plans. Plans of grandeur when I was elected to the East. I thought I would have speakers every week and pull tons of men back to lodge. I wanted to engage the membership and have many education nights. Alas, I was given a different opportunity. A better opportunity. I was given a ton of degree work. A week after being installed, I was conferring my first degree ever, a 2nd, as a matter of fact. Week after week, I was conferring degrees. It was awesome. Recently I did four 1st degrees over four weeks. I thought about doing them as a class, but we felt as a lodge it was more important for the candidate to have that special experience of an individual night, just for them. Two of my candidates, now Entered Apprentices were best friends. These gents had known each other since their childhood years, joined the military reserves together and now, became Masons together. Now that we had four new Entered Apprentices and no immediate degree work pending, it was time to do that other thing I wanted to do: engage the new members and help them understand the degrees they had just received. We organized an EA education night, The Entered Apprentice Academy is what we called it. We walked them through the degree, explained to them aspects of the symbology and gave them personal stories of our lives in relation to how Masonry has changed us for the better. We laughed, we had fun and we learned. At one point the subject of Clandestine Masonry came up, and two of my EAs looked at each other and then back at me and said at the same time and laughing, "Oh we found out about that..." I looked at them puzzled. In my experience, waiting to talk to the candidates until the 3rd degree about Clandestine and Irregularity is just too late. I feel you need to tell them [the candidate] about these organizations well before they go out into the world as EAs, otherwise they risk being tainted by potential bad information or in the case I was about to hear, outright slander, hazing and vindictive social media harassment. 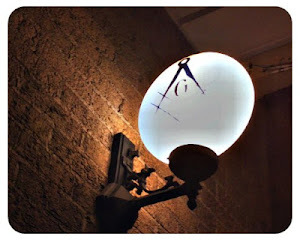 I have made it known that personally, I hold no ill feelings toward Clandestine or Irregular Masons, as long as it isn't the kind that gathers just to make money and has an "LLC" or an "Inc." after its name. I digress. My EAs proceeded to tell me that one of their co-workers found out that one of them had just received his EA degree, an auspicious occasion, no question. However instead of the typical congratulatory words, this co-worker first, claimed to be a brother as well and then proceeded to interrogate my EA in a completely condescending manner. And if this wasn't enough, he did it in public, around other people, citing ritual and all the rest. My Brother EA sat there and took it all in, the odd exchange had him on edge but he kept it together. Finally this co-worker called my Brother EA a "Clandestine" Mason. As if this wasn't enough he ridiculed the Brother on social media after finding his picture with me on our social media page the night after receiving his EA degree. He made derogatory comments and lambasted him. Again, repeatedly calling him "Clandestine" and "not a real Mason." Through all of this, all my Brother EA asked him was, "Let me see YOUR dues card." This co-worker refused and just kept pushing the hot buttons. I give credit to my EA for subduing his passions and an urge to put this co-worker in his place. The co-worker, after being asked to show his dues card repeatedly, finally did show my EA a card. And guess what? THE CO-WORKER WAS THE CLANDESTINE MASON! Apparently when my EA told him the lodge he was from (our lodge Waukegan 78 AF&AM Grand Lodge of Illinois), the co-worker knew of the lodge and of me. Well, I guess if a clandestine lodge and its members know who you are, maybe you're doing something right. I'm not one to get easily upset but this, Brothers, got me a little mad. So, guess what? I have blurred the names, but here you go, the business card of the lodge which decided to be decidedly unMasonic, and egregiously improper. 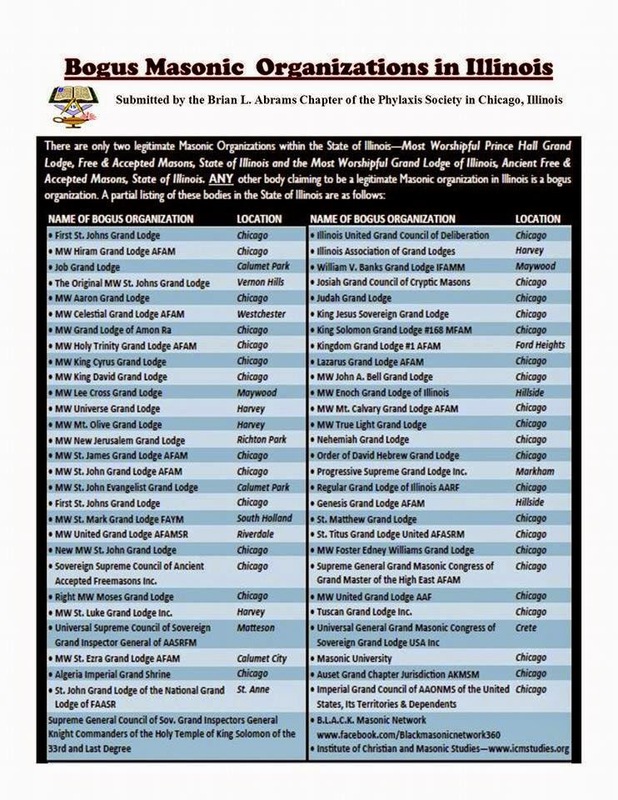 And if this "lodge" or its members has an issue with this, I suggest you go through the proper channels (contact my Grand Lodge), or take the time and become a legit lodge under the Grand Lodge of Illinois or the Most Worshipful Prince Hall Grand Lodge of Illinois. We all know what having "Inc." after your lodge name really means. And for those of you who don't it means, "We take your money and fool you into thinking we're legit." In conclusion, let it be known that "The Most Worshipful New Jerusalem Grand Lodge AF&AM. S.R. Inc." is CLANDESTINE and NOT RECOGNIZED. If you would like to read further about the issue of clandestine lodges, I suggest reading "Freemasonry In Black and White" or "ASpurious State of Confusion" by Bro. Charles Harper. Enjoy the parody video below about Clandestine Masons. It isn't far from the truth. "We all know what having 'Inc.' after your lodge name really means. And for those of you who don't it means, 'We take your money and fool you into thinking we're legit.'" Not all lodges (or grand lodges, for that matter) that have an "Inc." appended to their name are illegitimate or acting in a clandestine manner. For example, the Prince Hall Grand Lodge of Hawaii stylizes its name as the "Most Worshipful Prince Hall Grand Lodge, Free and Accepted Masons of Hawaii and its Jurisdiction, Inc." They are fully recognized by the Grand Lodge of Free and Accepted Masons of Hawaii, which was a formerly under the jurisdiction of the Grand Lodge of California F. & A.M. until 1989. Excellent article Brother Johnson. Hopefully it leads to us working more in Illinois. Great article Bro. Johnson. However clandestine/bogus grand lodges are indeed exploiting men and women for financial gain. We have a lot of work to do in Illinois. Very good article. I guess I'm lucky. In my 40 years as a MM, i have yet to run into a clandestine or irregular Mason like this one. I have run into Anti-Masons and have had to control my temper as they spouted their mis-information and refused to listen to the truth. Again. I just held my temper and walked away.